Major General (Rtd) Keith Mokoape, Chairperson of the Reserve Force Council (RFC), recently paid an impromptu visit to the Sea Cadets at Training Ship (TS) Woltemade in Lakeside, Cape Town. He was in Cape Town to attend Minister of Defence and Military Veterans Nosiviwe Mapisa-Nqakula’s Budget Vote speech at Parliament, where the RFC was tasked to address South African National Defence Force (SANDF) Reserve matters. It is perhaps no co-incidence that he chose to look at the youth as the future of the South African National Defence Force (SANDF) Regular and Reserve forces, especially with regards to the advantages brought by youth organisations. TS Woltemade, commanded by Sea Cadet Lieutenant Commander Paul Jacobs, is an example of an organisation which teaches leadership, discipline, and associated credited maritime oriented skills such as drill, sailing, seamanship, first aid and fire-fighting. The military foundation fostered in the Sea Cadets, assists in establishing patriotism and nation building and serves as a great motivator for the youth who wish to pursue a career at sea. The size of South Africa’s maritime mass is larger than the land mass, and the seaward border is extensive – encompassing 3 924 km at the high water line, with an economic exclusive zone of 1 553 000 km² (of which Marion Island and Prince Edward Island comprise 474 400 km²). In addition South Africa assists other southern African countries in respect of maritime training and protection. General Mokoape was impressed to find volunteer adult instructors, ex Sea Cadets and SAN Reserves, transferring skills and building the confidence of the Sea Cadets who are aged 13 to 18 years. Besides the morning colours parade, the Unit was abuzz with activities including seamanship, sailing, pulling and formative development classes being held for 150 youth from the suburbs of Cape Town. There are 11 other Sea Cadet Units around the South African coast and inland, with TS Attakwa in Oudtshoorn being opened in January 2018 to provide training opportunities there. These Training Ships are managed by volunteers recruiting youth from the surrounding areas. Recently, University of Cape Town (UCT) students from Groote Schuur Residence and Mansions attended practical leadership training activities at TS Woltemade involving a Leadership Practical Obstacle Course experience as well as functioning under command as a team rowing a boat, known as ‘pulling.’ The students’ feedback was that the experiences and interest of role models they were exposed to there would certainly have enhanced their leadership and development at school. TS Woltemade maintains a small book and DVD library focussing of naval, maritime, nautical, sailing, military and school setwork titles and study aids. This knowledge base enhances the Sea Cadets’ training experience, provides support for school studies, and ensures that they are provided with alternatives activities to combat gangs, drugs, and alcohol abuse. 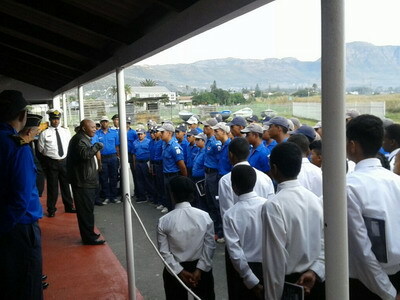 Practical outings are also arranged by the Unit to the South African Naval Museum in Simons’ Town, South African Maritime Training Academy (SAMTRA) ship’s bridge simulator, the Castle of Good Hope and its Military Museum, the SAMTRA training ship S.A. Agulhas, the Transnet National Ports Authority Port of Cape Town, trips at sea as well as engaging in any opportunity which would assist the Sea Cadets. TS Tiburon in Durban has also provided survival at sea and lifesaving training opportunities while other Units participate fully in community activities. General Mokoape, said the RFC promotes the development of Reserve Force support structures involving community, employers and employee, and assists with the development and implementation of the Reserve Force Voluntary System. The General promised that he would be back “sooner than they thought”. The Sea Cadets challenge all senior officers and members of society to pay an impromptu visit to youth organisations on or around 16 June 2018 – South Africa’s Youth Day.